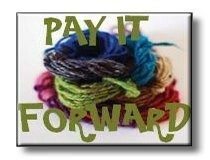 I will make and send a handmade gift to the first 3 people who leave a comment to this post on my blog requesting to join this Pay It Forward exchange. Since this should be fun let's give a reasonable amount of time for the handmade item to be made and then sent to the recipients - how about 2 months? I will email each person for their mailing addresses and send a handmade gift and maybe some extra goodies.